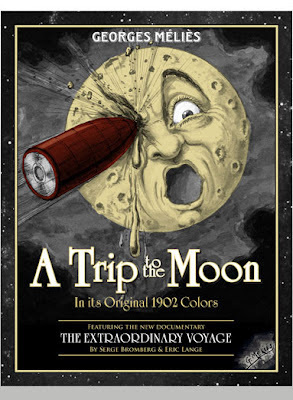 When I read an article at Fast Company last year about the restoration of a color-tinted version of George Méliès’ most famous film, A Trip to the Moon (1902), I almost didn’t believe what I read. I shared it in my Classic Links, and I was excited, but the story was so fantastic that it took me a while to truly understand what it meant. Once I did understand, I freaked out. I had to see this film! I was almost equally excited to see the documentary about this difficult, time-intensive, and expensive restoration: The Extraordinary Voyage. With no clue at all about the US distribution of the film, I wrote to one of the filmmakers, Serge Bromberg of Lobster Films, in Paris, France. Though I am sure Bromberg has got enough on his plate without having to deal with a classic movie blogger freaking out about his film, he kindly referred me to the American distributor of the DVD, Flicker Alley. Thank heaven the release was only a couple of months away. As you may guess from my masthead, I deeply revere both the films of George Méliès and his contribution to cinema. Before he laid his magician’s eye on this medium, it was commonly viewed as a curiosity for carnivals or a tool to be used by professionals, such as doctors, to perform their work. 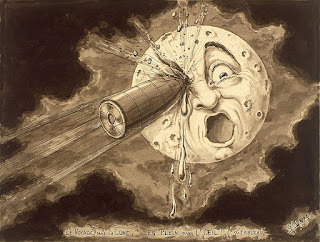 Maybe someone would have come along eventually and made the movies magical, but I am happy that Méliès got there first. He had the wondering mind and boundless optimism of a child and that is what the movies needed as they were being born. The DVD set comes with two major pieces: the restoration of the color film and the documentary. There are also three different black and white versions of the film, a couple of space-themed Méliès shorts and an interview with the band Air, which provided a new soundtrack for the film. 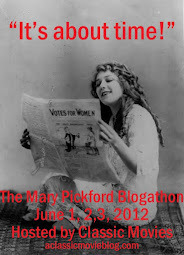 I’ll share the details of those extras and the gorgeous restoration in my post tomorrow. Today, I’d like to focus on The Extraordinary Voyage. The bulk of The Extraordinary Voyage focuses on Georges Méliès. It covers his life and career in a charmingly nostalgic way, with snippets of archival footage and lightly humorous visual gags. I appreciated this approach, because it brought to mind the mischievous sparkle that never left Méliès’ eyes, even when some hard knocks dimmed a bit of its light. In addition to biographical details, the film describes the phenomenon of early color films. Before color photography was perfected and theaters had the proper equipment for showing it, black and white movies were painted by hand, one frame at a time. The effect was more like watching a moving stained glass window than a true-to-life scene. For the films of Méliès, these artful hues were applied with the hard labor of 300 women, who earned one franc a day, sitting in a row of elevated desks, patiently painting images no larger than two centimeters. The facility belonged to Elisabeth Thuillier, a former glass and celluloid colorist, who would supervise operations by day and mix new colors by night. 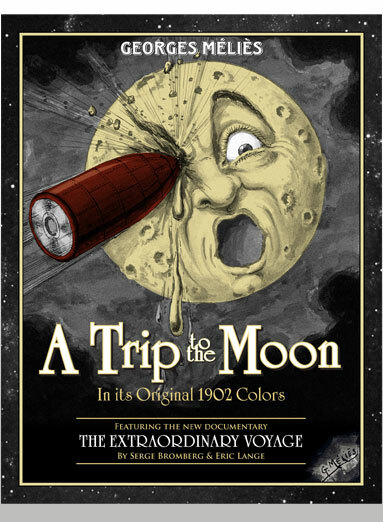 At first, I was disappointed that The Extraordinary Voyage did not spend more time on the process of restoring A Trip to the Moon (1902). The restoration was barely mentioned until 44 minutes into the 65 minute film. I didn’t think that could possibly be enough time, but I turned out to be wrong. Though the complex task of restoring all 13,375 frames of the film took over a decade to complete, the basic steps of the project were fairly straightforward. It all began in 1993, when Bromberg discovered a color version of the film existed in a Spanish archive. He arranged a swap, and brought the print to Lobster Films, a company dedicated to finding lost films that he heads with co-director Eric Lange. Upon opening the film can, they saw a solid block of material, and realized why their new acquisition had been easy to obtain. The film could not be peeled away from its tight coil. Upon closer examination, it turned out the film was only stuck together at the edges. The images were still relatively free. In order to free up those edges, the film was placed in a strong chemical solution that, while it would allow the frames to be unpeeled, would also eventually destroy them. The team worked quickly to digitize images as they were removed from the reel. Once these were saved, they waited for technology to advance to the point where the project could continue. It took eight years for the restoration to continue, but the group used this time to find funding and support, which they eventually got from the Technicolor Foundation for Cinema Heritage and Groupama Gan Foundation for Cinema. These groups made it possible to complete the project. The restoration was a complex process of matching colors, replacing fragmented film and organizing thousands of digitized frames. It was fascinating to witness the powerful combination of technical knowledge and determination that kept the restoration team moving steadily forward. The optimism of the team was inspiring. They never seemed to feel there was any choice but to succeed. Over the past year I have finally started to understand what film restoration entails and how difficult, complex and ultimately rewarding it can be. The Extraordinary Voyage is yet another story that fills me with admiration for the people who put their passion and intelligence to the monumental task of preserving our filmed history. Thank you to Flicker Alley for providing a copy of the DVD for review.